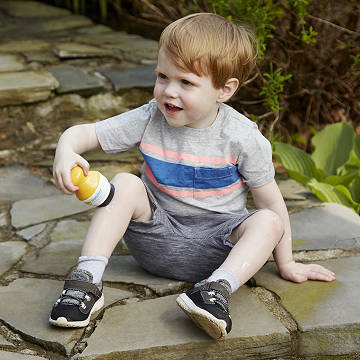 A child-friendly applicator makes it easy for even small children to apply their own sunscreen. The sun is fun, but sunburns, not so much. Applying effective sunscreen each time they go in the sun is a habit every child should learn. Our child-friendly Solar Buddy's rollerball applicator makes it easy even for small, not-so-practiced hands to put it on without making a mess—even when you're not there to help, like at school or camp. Fill it with your preferred sunscreen and pop it in their beach bag or backpack, or your own hand luggage (it's below the maximum for liquids on a plane). Made in China. Clean with luke warm water. Do not leave in extreme heat for a prolonged time.